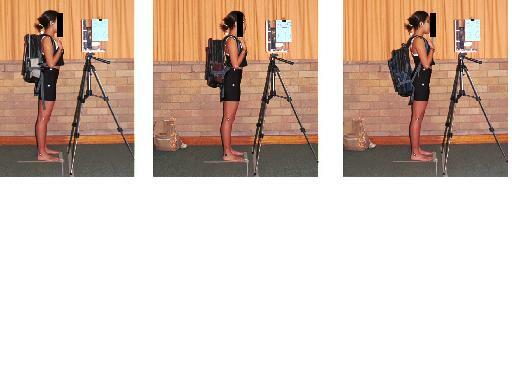 Backpack loads produce changes in standing posture when compared with unloaded posture. Although 'poor' unloaded standing posture has been related to spinal pain, there is little evidence of whether, and how much, exposure to posterior load produces injurious effects on spinal tissue. The objective of this study was to describe the effect on adolescent sagittal plane standing posture of different loads and positions of a common design of school backpack. The underlying study aim was to test the appropriateness of two adult 'rules-of-thumb'-that for postural efficiency, backpacks should be worn high on the spine, and loads should be limited to 10% of body weight. A randomised controlled experimental study was conducted on 250 adolescents (12–18 years), randomly selected from five South Australian metropolitan high schools. Sagittal view anatomical points were marked on head, neck, shoulder, hip, thigh, knee and ankle. There were nine experimental conditions: combinations of backpack loads (3, 5 or 10% of body weight) and positions (backpack centred at T7, T12 or L3). Sagittal plane photographs were taken of unloaded standing posture (baseline), and standing posture under the experimental conditions. Posture was quantified from the x (horizontal) coordinate of each anatomical point under each experimental condition. Differences in postural response were described, and differences between conditions were determined using Analysis of Variance models. Neither age nor gender was a significant factor when comparing postural response to backpack loads or conditions. Backpacks positioned at T7 produced the largest forward (horizontal) displacement at all the anatomical points. The horizontal position of all anatomical points increased linearly with load. There is evidence refuting the 'rule-of-thumb' to carry the backpack high on the back. Typical school backpacks should be positioned with the centre at waist or hip level. There is no evidence for the 10% body weight limit. High school students in Australia are aged 12 to 18 years, during which time they undergo rapid musculoskeletal development [1–3]. High school students carry their educational loads mostly in backpacks, without the workplace standards that have been developed for adults. There is limited understanding of adolescent postural responses to backpack loads and positions, and exposure to load (i.e. the amount of time that it is carried) [4–7]. Common but unsubstantiated 'rules-of-thumb' for adults, that are often applied to adolescents, are that backpacks should be positioned high on the trunk, and loads should be limited to ten percent of body weight. The appropriateness of these rules to adolescents has not been well researched. Efficient erect adult human posture is believed to reflect the least amount of physical activity required to maintain body position in space [8–12], and which minimises anti-gravity stresses on body tissues. This is considered to occur in the unloaded state when the body is closely aligned with a vertical reference (reflecting gravity). Application of external forces to the body (such as in a backpack) is commonly associated with postural deviation from close alignment with the gravitational axis. Unloaded posture that habitually deviates from gravitational alignment has been associated with spinal pain [8–13]. While posterior loads will necessarily change body posture because of changes to centre of gravity,[6, 7, 9], efficient adult posterior load carriage (that which minimises spinal tissue stress) has been related to minimum load, the position of the backpack close to the body's centre of gravity, and the capability of the backpack to accommodate the load close to the spine [6, 7]. While there is no evidence to suggest that these parameters should not also be applied to adolescents, the effect on their postural responses to load of musculoskeletal development, muscle strength, relative weight to load, gender and age have not been explored in the adolescent population. Thus there may be differences in adult and adolescent responses to posterior loads which may make adult 'rules of thumb' inappropriate for adolescents. Our cross-sectional study [14–17] provided unique information in Australia on adolescent educational load carrying behaviours, pain and posture. We are currently testing our cross-sectional findings in a longitudinal study. Over 90 per cent of the 1269 subjects in our cross-sectional study  reported that they carried their educational loads in backpacks positioned over both shoulders, if walking for more than a few metres. Our study found a range of backpack designs and brands, but most had common features, such as only one size, no internal pack framing or back support, no internal compartments to separate and distribute the load, adjustable only at shoulder straps, no waist or chest straps and no load compression features. Capacity ranged from 30–40 litres. Average backpack loads weighed 5.3 kilograms (SD 1.9 kgs), and ranged from 1.1 kgs to 22.5 kgs. There was no influence of age or gender in the backpack loads being carried, in that boys and girls, from the youngest and to the oldest students, carried backpacks of similar raw weights. Overall, these backpack weights reflected an average of 10.2% body weight carried (SD 2.9). We demonstrated a significant positive linear relationship between 'forward' head on neck posture (craniovertebral angle) and backpack weight , and significant associations between reports of recent spinal pain and heavy weight [16, 17]. Students mostly carried their backpacks centred over the buttocks or hips. We hypothesised that the 'rule of thumb' regarding efficiency of backpack position could be supported if we found that when a backpack was carried high on the spine, the amount of postural adjustment to load (compared with unloaded) was less than when the backpack was in any other position. We further hypothesised that the 'rule of thumb' regarding backpack load would be supported if we found a different type of postural response to 10% body weight, compared with lesser weights. This paper reports findings of a controlled, randomised experimental study that described the influence of posterior loads on adolescent static standing posture in the sagittal plane. Ethics approval was obtained from relevant university and government departments. To protect subject health, we specified a 'stopping rule' (complaint of pain during testing). The ethics committees limited the experimental conditions to 10% body weight or less, on concerns of potential injury to subjects with heavier loads. Following participation in our earlier research [14–17], five high schools volunteered for this project. This provided a study population of approximately 7500 students (around 1500 students per school). Sample selection was by random numbers applied to class lists, seeking five males and females from each year level in each school. Student names were excluded from the class lists by teachers prior to selection if they were known to have recent fractures or sprains anywhere in the body, musculoskeletal or neurological diseases, or were unable to stand upright on two feet for testing. Selected students, in conjunction with their parents, consented in writing. Further screening was undertaken prior to testing by the research team, to eliminate consenting students who had scoliosis or kyphosis. Sample size was based on findings from our previous investigations into backpack load and head-on-neck posture  (measured as the craniovertebral angle (CVA)). This is reputedly a robust posture measure for adults [9, 11–13] although it has been less frequently reported for adolescents [15, 19]. Power analysis  incorporating significance of 0.05, power of 0.80, a standard deviation of four degrees, and an expected change of CVA of at least five degrees under an experimental condition, suggested a minimum sample of 225 to detect significant change between baseline and experimental conditions, within subgroups of gender and year level. For ease of trial management, we tested 250 students (50 students per school reflecting 5 girls and 5 boys from each of the five high school year levels. We tested nine experimental conditions (combinations of percentages of body weight (three, five, ten per cent), carried in one backpack positioned with its centre at upper (T7), middle (T12) and lower spinal (L3) positions (backpack test positions illustrated in Figure 1). To position the backpack in the three test positions, shoulder straps were adjusted according to subject height to lift the backpack into the appropriate position on the spine. The experimental conditions were applied using a block (Latin square) design (illustrated in Table 1), which provided efficiencies for treatment administration and calculation of condition order effects . We also took three measurements of unloaded (baseline) postures for comparison measured prior to commencement of testing, after intervention four, and at completion of the testing block. In this way, subjects acted as their own controls, where baseline (control) posture could be compared with posture under the different experimental treatments. Validated study protocols were derived from our earlier research , and were compiled into an instruction manual which is available form the authors at no cost . We used the one backpack for all tests. It had features that were typical in the majority of school backpacks observed in our cross-sectional study , comprising a soft backpack with no internal framing or back support, two padded adjustable shoulder straps, no internal compartments, one size only and with no waist, chest or load (side) compression straps. Its capacity was 35 litres. Experimental loads were applied as percentage of subject body weight to control for the effect of body weight within our sample. Subjects were weighed on the one set of regularly calibrated electronic scales (Mettler TE120) (accurate to within 0.001 kg, up to 120 kgs). Subject-specific loads were assembled from a range of weights whose dimensions replicated typical educational material. Loads were fixed within the backpack at 100 mms of the spine, to standardise load displacement in the backpack. Measures of sagittal standing posture are commonly used estimates of the response of the human body to its environment [8, 9, 11, 13, 20, 25], and are accurately measured by photograph [11–13, 20, 25]. Still photographs provide point-in-time posture measures, which can be quantified as the position of landmarks on the body against standard references. One Canon SLR camera (EOS 500), loaded with Fuji ASA 100 film, was used to take still photographs of subjects' sagittal postural response to experimental conditions. We had previously found that this camera and film type minimised distortion in image capture . The camera was mounted on a tripod (Hama Profil 76) set at 3.1 metres and at 90 degrees to the right of the subject's midline to accommodate the tallest subject. The three planar positions of camera on tripod were monitored throughout testing by spirit levels . Subjects wore bathers or tight 'bike' shorts and a sleeveless T-shirt top. Lateral anatomical landmarks were marked by adhesive paper dots contrasting to skin colour. They comprised the tragus of the ear, mid-acromion of the shoulder, lateral superior iliac crest, greater trochanter, head of fibula and lateral malleolus of the ankle, and a projecting reflective marker was placed posteriorly on the spinous process of C7 [8–13, 20]. Subjects were allocated sequentially to the Latin square order of testing by an independent research assistant. A second research assistant applied all the experimental treatments. One photographer took a sagittal photograph for each of the 12 conditions (nine experimental treatments and three baseline measures). Subjects stood in a standard position for each photograph . The research assistant removed the backpack after each experimental treatment and subjects were encouraged to relax and move about. This person also checked the sagittal position of each subject to correct for segmental rotation, prior to the next photograph being taken. Photographs were taken three seconds after positioning the backpack on the subject. Photographs were developed as negatives which were scanned as electronic computer files using a 35 mm film scanner (Nikon LS 2000). We used standard positions of the negative within the scanner , scanning speeds and image resolution. Vertical and horizontal coordinates were calculated of the centre of each anatomical landmark on each photograph by the one measurer (digitiser) using digitising software  and using standard protocols for digitising . 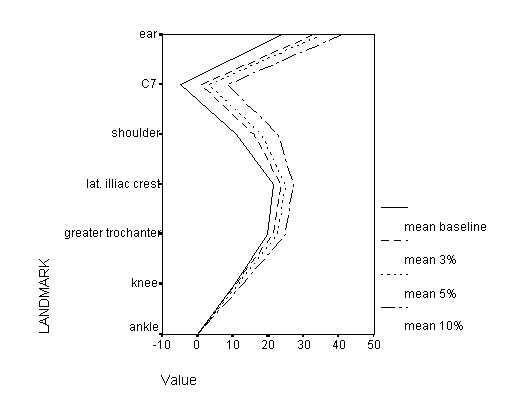 All coordinate values were standardised to the ankle (representing x = 0, y = 0), allowing comparison of posture change between and within subjects. Our pilot studies indicated that by strict use of the protocols, the error of measurement could be estimated as two pixels at each anatomical point in the photograph. Subjects could not be blinded in this study to the test conditions, but they were blinded to the hypothesised outcomes. We attempted to blind the photographer and digitiser as much as possible to experimental backpack weights, order of administration of weight and hypothesed outcomes. ♦ the effect of gender, year level and order of testing. The quota for each of the five year levels was filled completely, reflecting boys and girls of average age 12.6 years, 13.7 years, 14.7 years, 15.6 years and 16.7 years respectively (all Standard Deviations approximating 0.5 year). Once enrolled, no subject left the sample, either by exclusion for scoliosis or kyphosis, withdrawing, or by application of the 'stopping rule'. There were 98 refusals to participate, with no difference in rates of responses from boys and girls, or between schools. Most refusals came from students in Years 9 and 10 (outlined in the trial profile (Figure 2)). The mean (SD) height and weight values for girls and boys in each year level are reported in Table 2, with mean experimental loads (SD). Significant differences are noted by italics. Mean age (years), height (cms), body weight in kgs (SD) and mean three, five and ten percentage loads in kgs (SD). Significant gender differences in height and body weight within year levels are highlighted by italics. Table 3 reports the means (SD) of each baseline measurement, the F values (df) and associated p values from the repeated measures analysis of variance tables. There were small mean differences between the three baseline posture measurements at the tragus of the ear, spinous process of C7 and lateral superior iliac crest. These differences were less than estimated error in measurement, and therefore indicated that baseline (unloaded) posture was consistent throughout the test procedure. Tables 4 and 5 report the findings from the multivariate ANOVA models which tested the effect of experimental conditions. 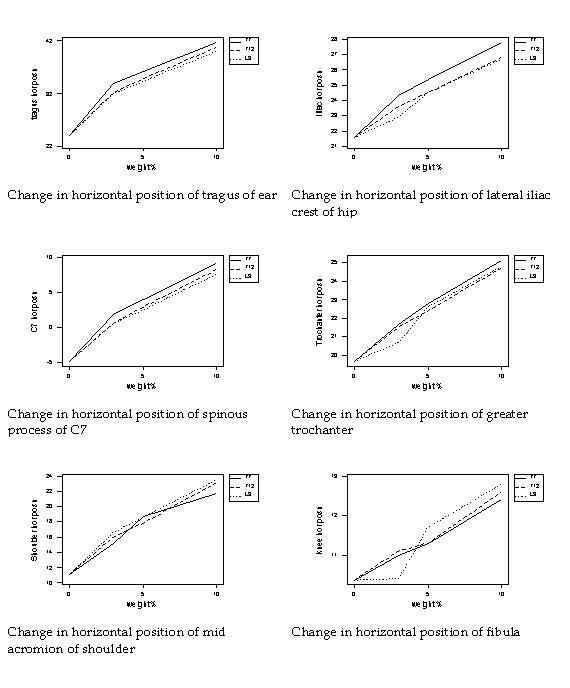 Gender, year level and effect of order of testing did not significantly influence postural response at any anatomical point (illustrated by the non-significant higher order interaction effects in Table 4). Mean values (SD) of x coordinates for experimental conditions Key: 3%: three per cent body weight, 5%: five per cent body weight. 10%: ten per cent body weight. T7: backpack positioned at the seventh thoracic vertebra. T12: backpack positioned at the twelfth thoracic vertebra. L3: backpack positioned at the third lumbar vertebra. There was a significant effect of backpack position at tragus of ear, spinous process C7, mid acromion of the shoulder and lateral superior iliac crest.. Table 5 and Figure 3 illustrate that positioning the centre of the backpack on the upper spine (T7) produced the largest horizontal displacement at all anatomical points except shoulder and fibula. For each of the six anatomical points, there were significant postural responses related to backpack weight, illustrated by significant weight effects in Table 4 and increasing mean horizontal responses to load in Table 5, and in Figures 3 and 4. Figure 4, a schematic diagram which represents the body's postural response for each backpack load, averaged over the three backpack positions, illustrates that the largest response for each load occurs at the shoulder. The shoulder response is indicative of head and neck positioning. There was no higher order interaction effects of backpack load and position on postural response (see Table 4). The potentially confounding effects of body weight and height on postural response were controlled by the subject-derived experimental treatments (percentage of body weight load, and backpack position on the spine), and by standardising postural measures to the ankle. This paper reports an attempt to understand the influence on horizontal measures of adolescent sagittal static standing posture of different percents of body weight carried in a typical school backpack in different positions on the spine. Recruitment was more difficult from students in Years 9 and 10 than in the other year levels. Measurement of posture using photographs may have been a disincentive to these adolescents whose growing bodies may be a source of embarrassment [2, 3]. This may explain refusals by many 13–15 year old girls and boys, despite parental consent, and assurances of privacy and confidentiality. Although it is possible that our Year 9 and 10 subjects (14–15 years old) had better body image than non-participants, the lack of age or gender differences across our sample suggests that the postural responses of these students were no different than those of the subjects in the other year levels. Potential differences in adolescents' posture due to gender-specific rates of pubertal growth [2, 3] underpinned our within-subject approach to determining experimental conditions, as opposed to testing standard loads or heights of backpack placement on the trunk. The lack of year level or gender influences on postural responses suggested that our design adequately controlled for these effects. This finding indicates that generic backpack load recommendations for adolescents could be developed in future studies, provided the recommendations are based on loads and spinal positioning that are relative to the individual's weight and height. We did not attempt to identify subjects with 'poor posture' either at baseline or under experimental treatments. We sought only to quantify the within-subject differences related to the experimental conditions. Despite the common acceptance that 'poor' sagittal adult standing posture is not closely aligned with the gravitational line [8–10], there is no standard threshold of deviation as a marker of 'poor posture'. Thus it may be that subjects with 'poor posture' had a different response to experimental conditions than subjects with posture that was more closely aligned with a vertical reference. We are currently undertaking this investigation. Positioning the backpack high on the spine produced largest postural response at all anatomical points. This finding contradicts the 'rule-of-thumb' that higher load positioning is better. These findings also support our observations of common practice by adolescents regarding lower carriage of backpacks . Lower backpack positions on the adolescent spine plausibly approximate load to the individual's centre of gravity [6, 7], which we suggest requires less postural adjustment to maintain the body's position in space [8, 9]. Compared with other landmarks, the lack of a corroborating effect of the largest horizontal effect of the T7 backpack position at the shoulder may relate to the multidirectional construction of the shoulder joint, and local mechanical effects from approximation of this joint this backpack backpack position. Adolescents' response to increasing posterior load, irrespective of backpack position, was to place all anatomical points progressively more anterior to the ankle. Shoulder displacement appeared to determine movement of all points above. Our findings support those from the literature, in which any posterior load produces a different sagittal position from unloaded [6, 7, 19, 25]. This is plausible because of the need to adjust the body's centre of gravity to accommodate a posterior load. What we did not find was a difference in postural response of 10% body weight, compared with less weight. Thus the hypothesis that loads should be limited to 10% body weight could not be supported. It appears from this study that there is a dose-response relationship between backpack load and horizontal placement of sagittal plane anatomical points. It is implausible however, that this dose-response would continue with increasing loads at all anatomical points above the ankle, because of the body's requisite adjustment of the centre of gravity to accommodate the load . Therefore, further testing is required of postural responses to greater loads, relative to body weight. Ethical permission for such testing on adolescents would require assurances that no harm would occur to them from spinal 'overloading'. Despite common practices by adolescents demonstrated by our cross-sectional study , where 10% body weight was the average load carried, rather than the greatest load carried, such assurances would require more knowledge than is currently available regarding spinal tissue responses to posterior loading. We chose sagittal anatomical points to allow us to visualise the postural response of each body segment. These points had been reported previously [8–14] and allowed us to take a comprehensive view of whole body and inter-segmental responses to posterior loading. However, the position of the backpack precluded measurement of anatomical points on the thorax or low back. Measurements from these areas would provide further information on the body's postural response to repeated positioning of a posterior load, particularly the inter-segmental response to posterior loads. Research is required to develop processes to measure landmarks on the anatomical areas whilst they are covered by a backpack. Backpacks featuring more sophisticated load carrying systems and/ or load reduction features may perform differently from our 'typical' school backpack, potentially enabling students to carry more weight with different postural adjustments. Thus, it may be inappropriate to extrapolate our findings to all school backpacks. Thus other styles of backpack used by adolescents should be tested in the same manner as this investigation for their effect on posture under different load arrangements (for instance, the effect of waist and chest straps, side compression straps, and compartments within the backpack to partition the load). The findings from this study are relevant for all adolescents, irrespective of gender or age. We found evidence to refute one common 'rule-of-thumb' for load carrying, that is that backpacks should be positioned high on the trunk. Loaded sagittal standing posture was the most horizontally displaced when adolescents carried a typical school backpack with its centre positioned midway between the shoulder blades, compared with lower positions. The backpack position associated with least postural displacement was with its centre positioned approximately at the student's waist or hip. This study could not find evidence to support the 'rule-of-thumb' that loads should be limited to 10% of body weight. Sagittal posture increased linearly with load, and thus there was no evidence of a different type of postural response to the heaviest load, compared with the lightest. Until more is understood about 'poor' posture, adolescent postural response to posterior loads, and how this relates to spinal pain, we recommend that adolescents position the centre of a typical school backpack at approximately waist level, and that they actively reduce their backpack loads to minimise postural displacement. This research was conducted with funding provided by a 1999 National Health and Medical Research grant, Australia. The study was supported by the Department of Education, Training and Employment in South Australia, Australia. The authors thank Anthony Cockington and Rotsalai Kanlayanaphotporn for assistance with data collection.